Woo Hoo! 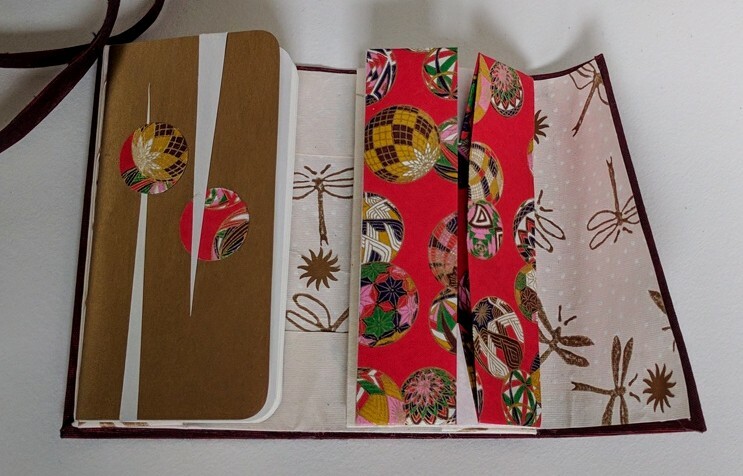 Asahi Bookcloth and Chiyogami! 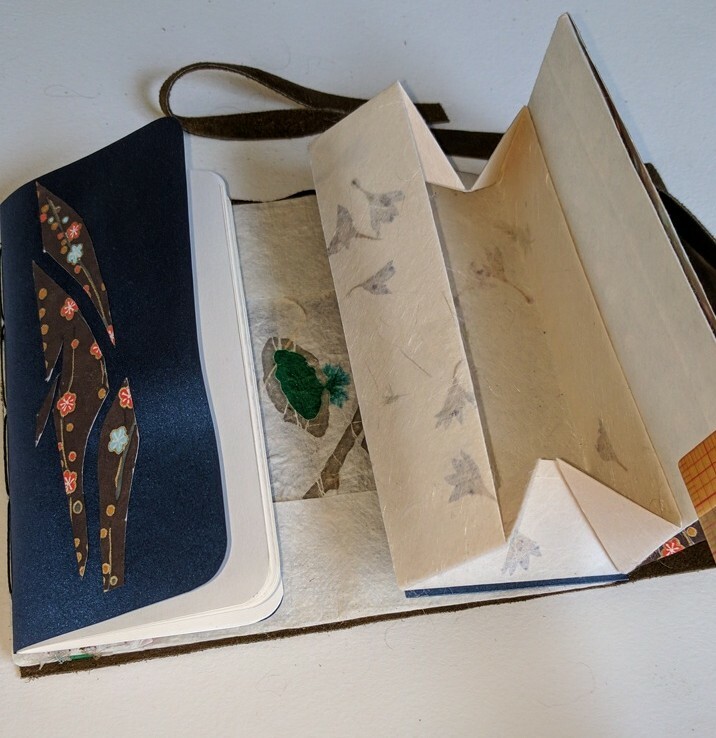 As I continue to make Chinese Thread Books, I’m finding that I am beginning to develop preferences. 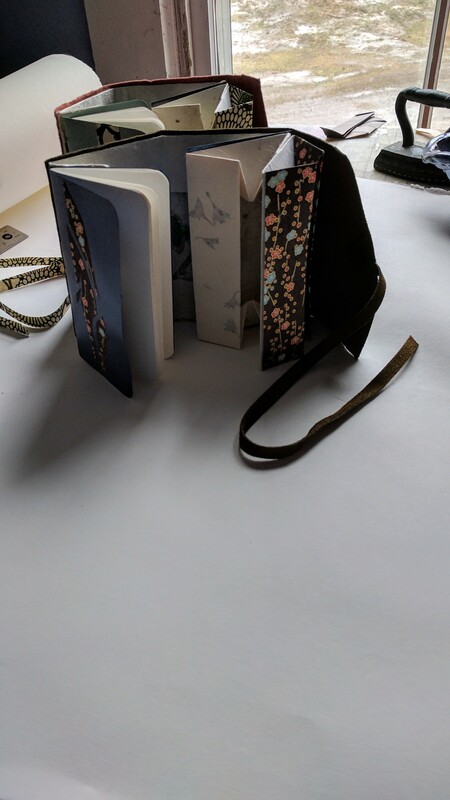 Already, I find that I like Chiyogami paper for the first layer box, a delicate, subtle paper for the second layer box, Stardream Metallic for the pamphlet and hidden sleeve. 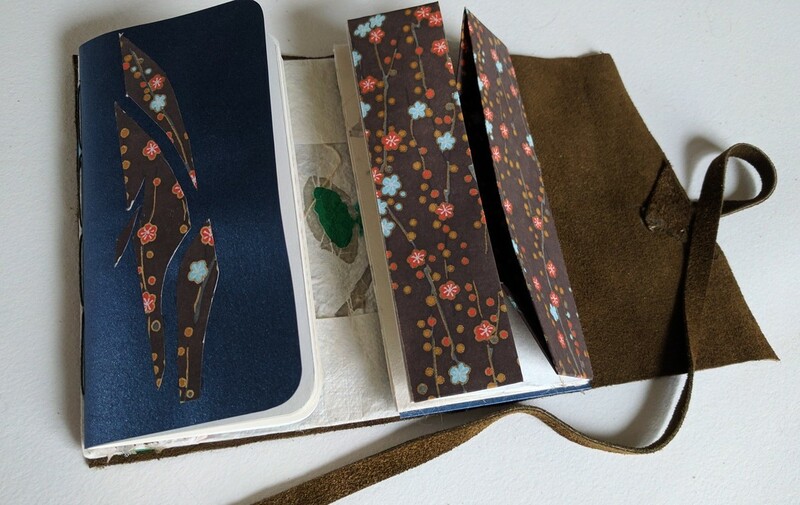 Now, after trying out the silky Japanese Asahi bookcloth for the cover, well, I’m hooked. 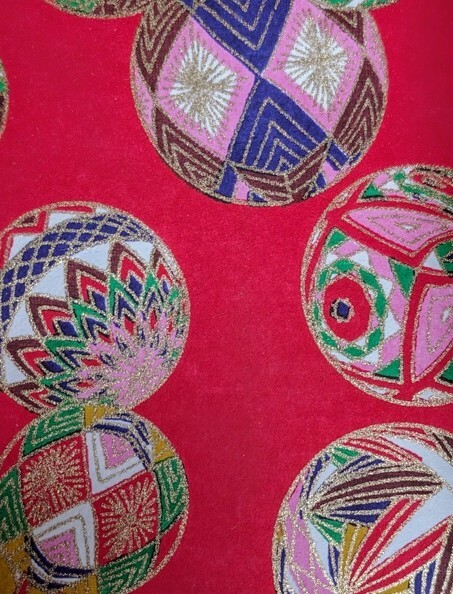 This mostly red Chirogami pattern is not something that generally would catch my eye to use and buy, but I just loved the details of the patterns in the spheres. The toughest part of using it was finding papers to go with it. So detailed and beautiful, but does not play well with others. After much searchinger around, here’s what worked for my eye: Gold Stardream for the pamphlet cover, embellished with Stardream Metallic Quartz and random Chiyogami circles. 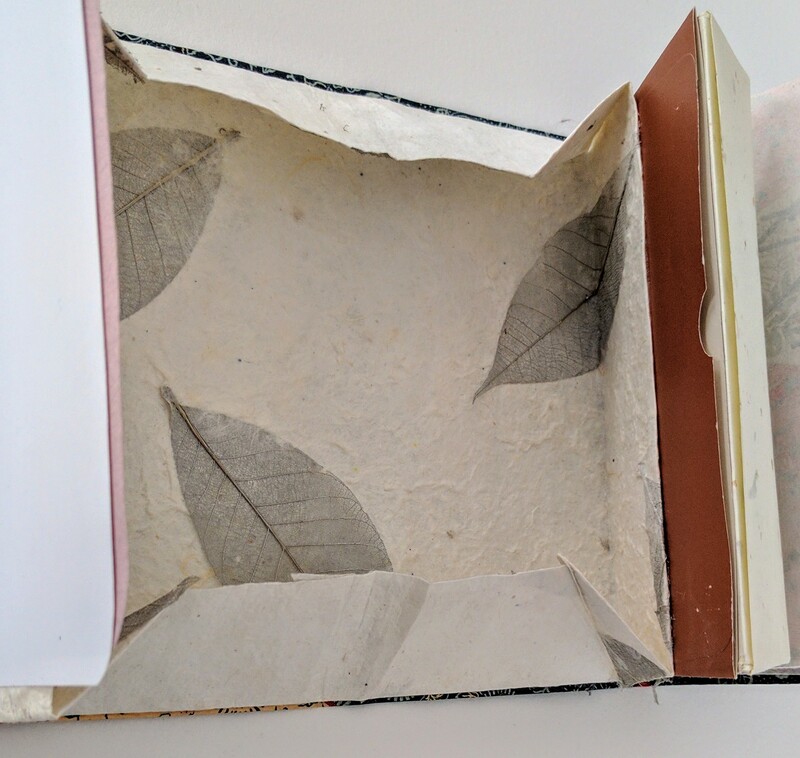 Second layer box is a soft paper embedded with flowers. 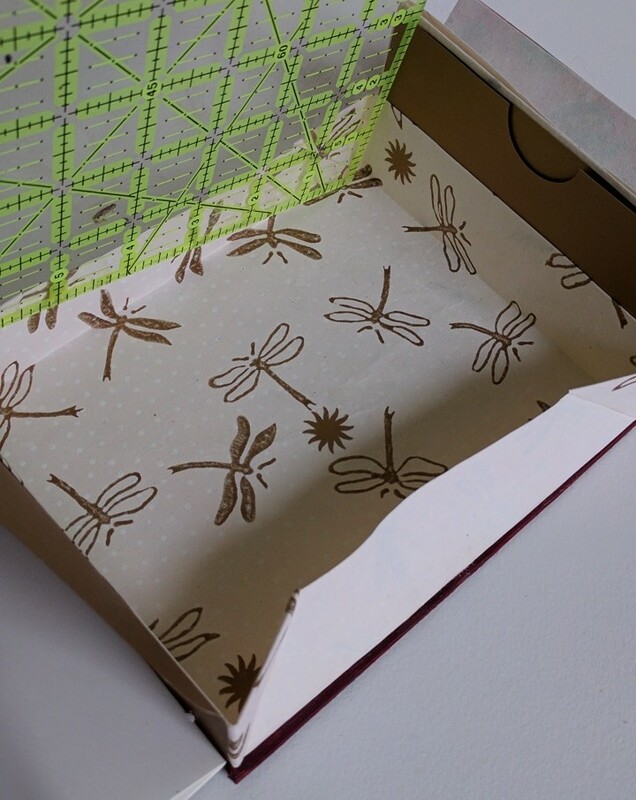 Gold Dragonfly paper for the big box, to which I’ve added a few golden starbursts. 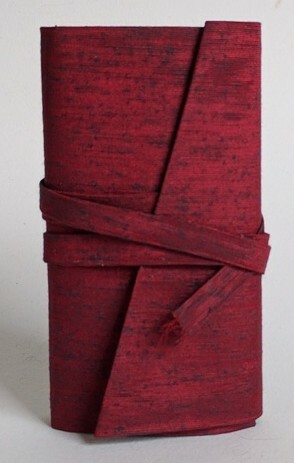 All wrapped up in Asahi bookcloth. This continues my posts about assembling different structures based on the Chinese Thread Book, using different papers. 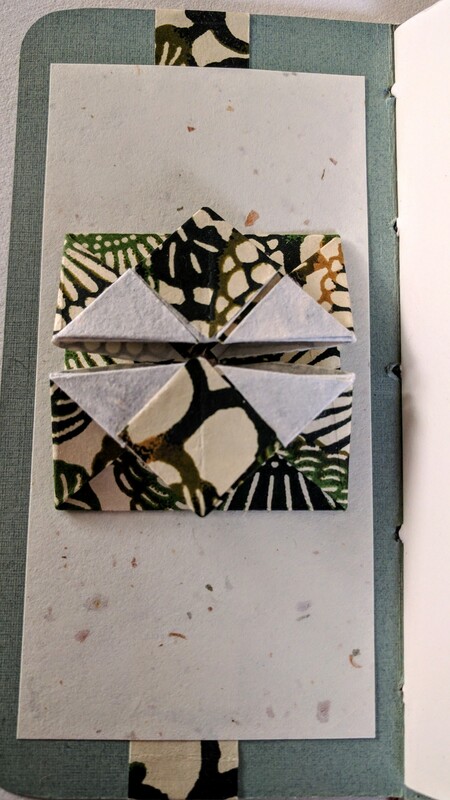 I had thought I was going to be doing the same thing over and over again, with no variations other than using papers with different colors and patterns, but it hasn’t worked out that way. Here’s where I started using the Stardream Metallic for the cover of the pamphlet on the left. More and more I’m liking how the Stardream paper matches the Chiyogami printed papers. Notice the style of the little box inside of the pamphlet. After trying out many variations I absolutely loved this little twist box with the pinwheel top. 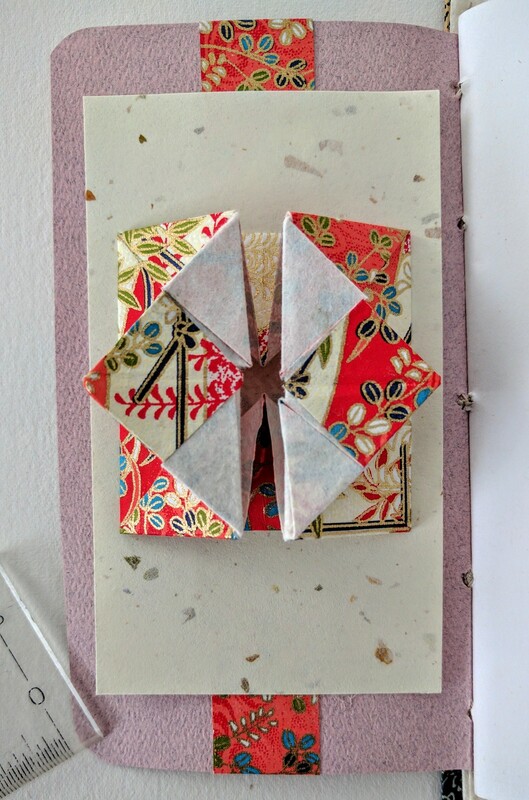 I think it’s something about the pattern of the Chiyogami paper that made other style box I’ve been making look, well, not so good. 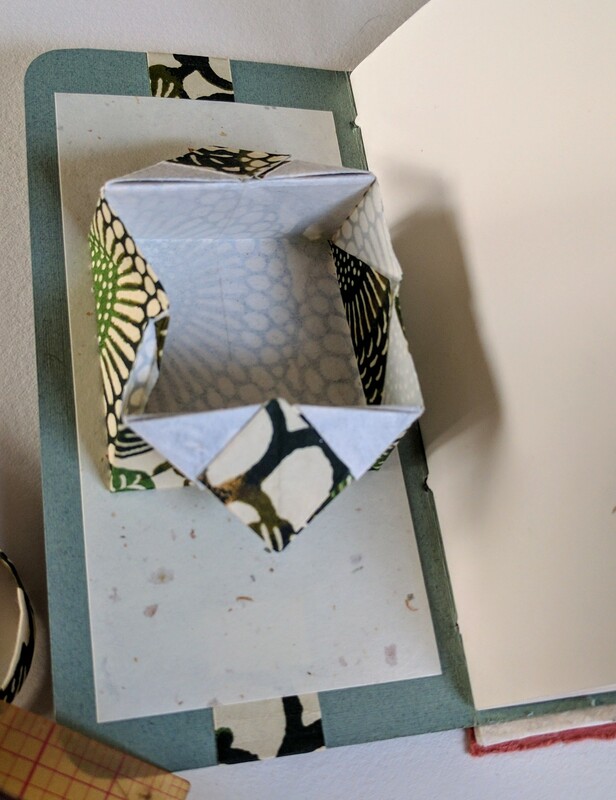 Am so pleased to have stumbled upon this way of making the twist box. Here’s the pinwheel-top box, twisted open. 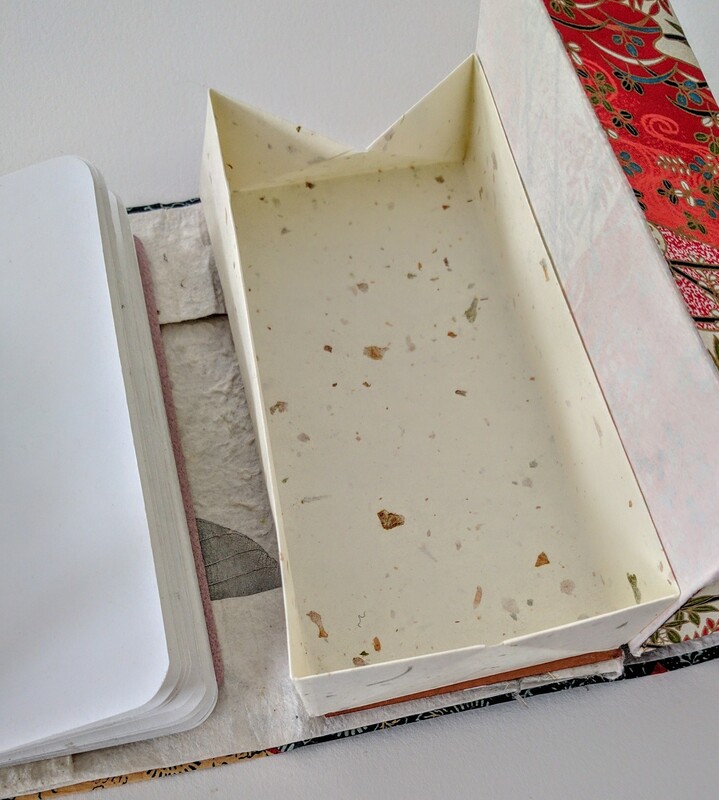 The second layer rectangular tray is made from a soft handmade paper from India. Underneath the tray is a sleeve made of Stardream paper, which matches the pamphlet. Big box layer is another handmade paper, but not sure where it was made. I have a stash of this from a place that Elisa Campbell wrote about, Creative Papers, which, sadly, is no longer is business. 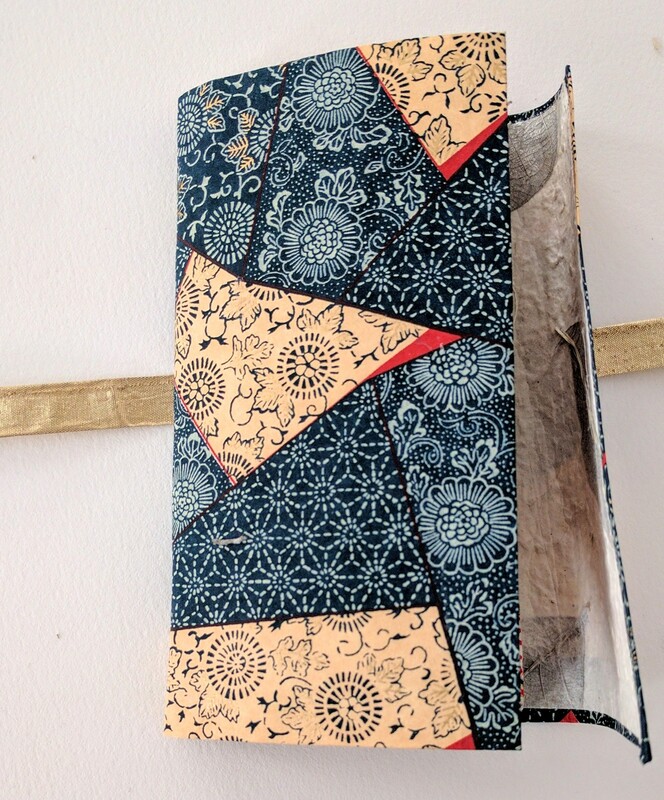 The biggest surprise for me was the choice I ended making for the cover of this Thread Book. 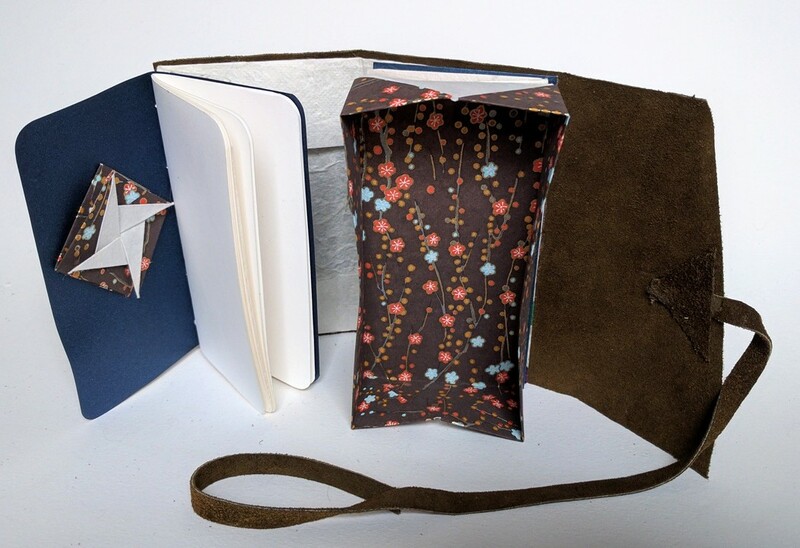 I tried matching the book with other Chirogami papers, with handmade papers from Dieu Donne and elsewhere. I tried my (faux!) 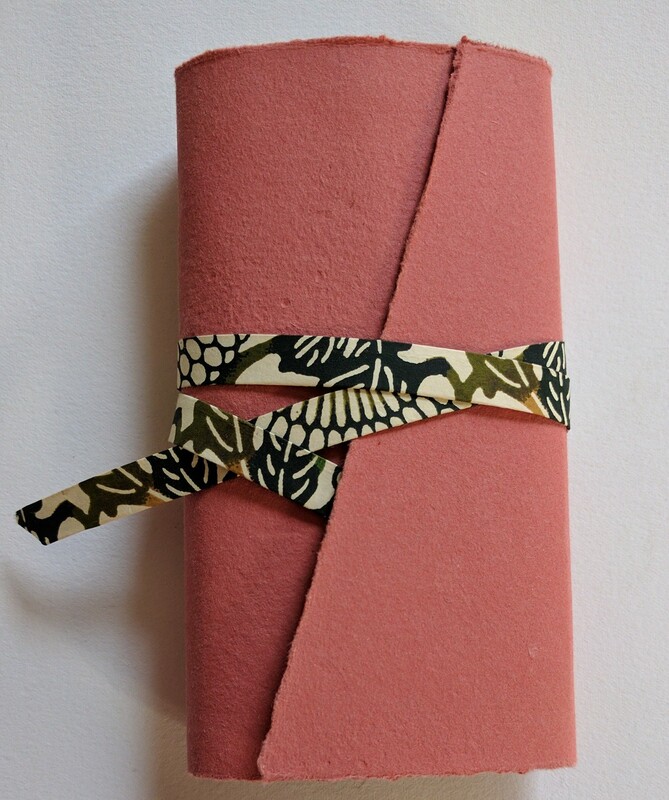 elephant hide paper, and tried matching it with all sorts of cloth. Then I tried it out with this piece of suede, and it just snapped together. I never thought I use this suede for anything, but it seemed perfect for this project. I just love how I get to use all these odds and ends of materials! What’s different, besides the suede, about this particular piece is that it doesn’t suggest a use to me. The first one of this group that I wrote about seems like a valentine waiting to happen, the one after that feels like a gardener’s journal, and the next one I will be writing about feels like a holiday journal. But this one isn’t telling me what it needs to be. Hope someone else can figure it out. 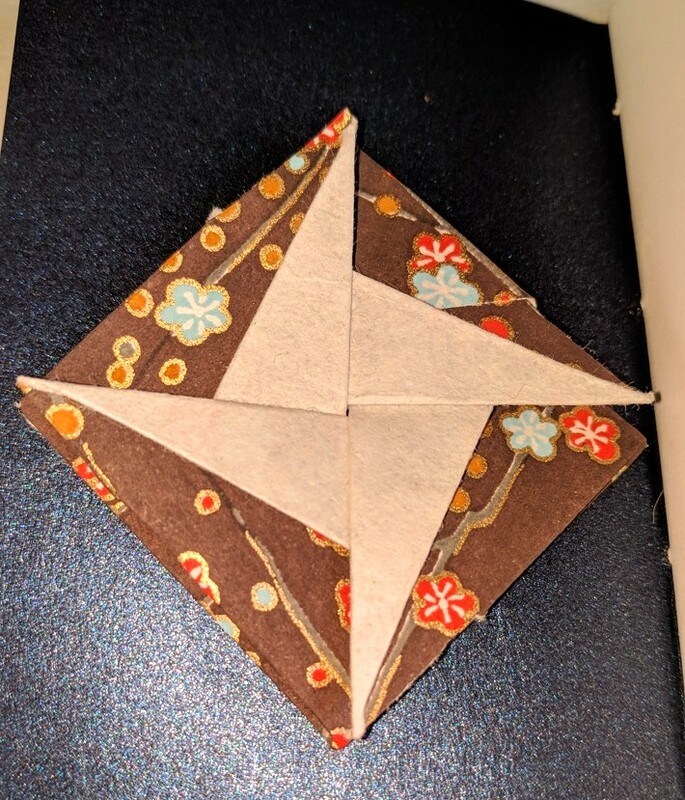 My thought was that I would make a model based on the Chinese Thread Book, then make variations of said model using different papers. Turns out that using different papers resulted in creating many more questions than I anticipated. My next few posts will be showing how these questions got answered, one Zhen Xian Bao at a time. 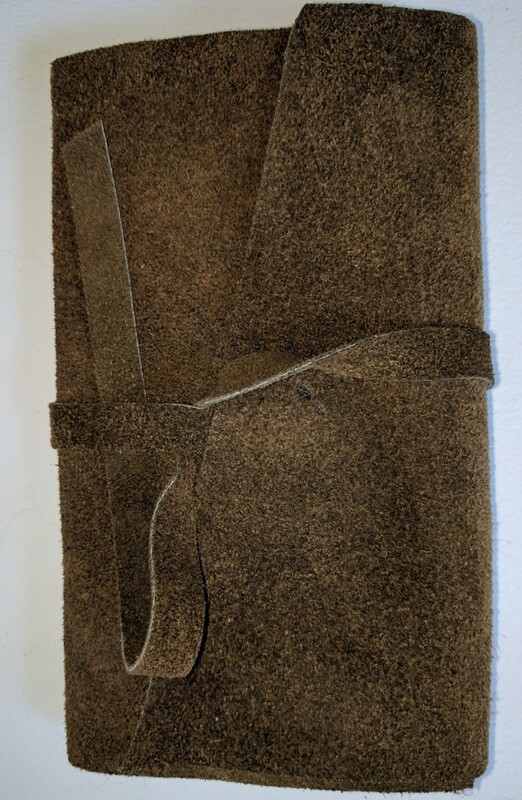 Whereas my previous thread-book-variation has a romantic feel to in, this one feels earthy to me, like it’s meant for keeping track of seeds, gardens, and planting/harvesting info. 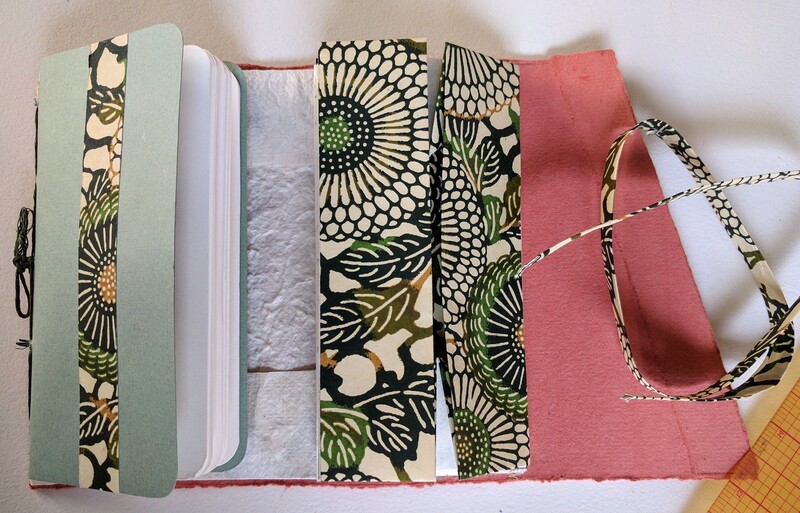 The green print is Chiyogami paper from The Paper Place, and the solid green on the left is Neeneh Classic Linen Cover, Augusta Green. 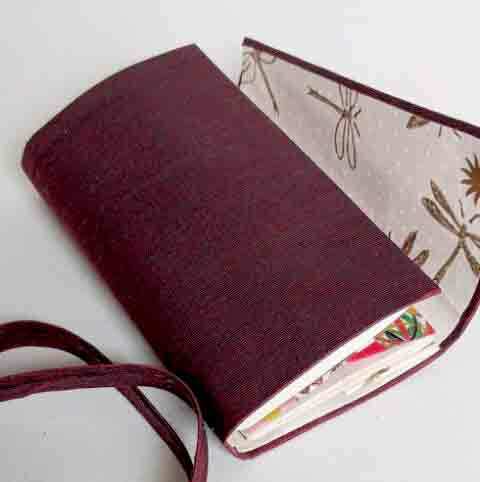 The pamphlet on the left is constructed with a five-station pamphlet stitch using waxed linen thread. The book block is Mohawk Superfine. 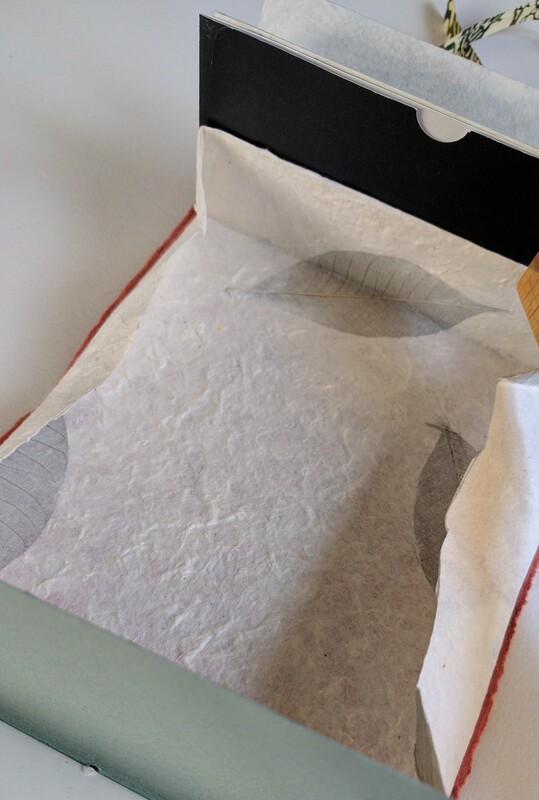 The second tier box on the right is machine-made paper infused with flower petals. 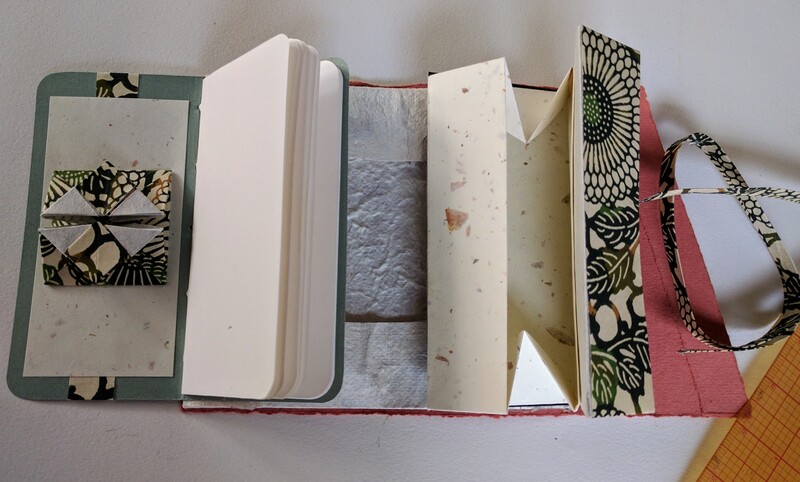 Both the pamphlet and the rectangular trays fold away to reveal a big rectangular tray as the bottom layer, made with handmade paper from India. You can also see in this photo a sleeve made from Metallic Stardream paper. underneath the second tier try. Inside the pamphlet is a small envelope that expands into…. 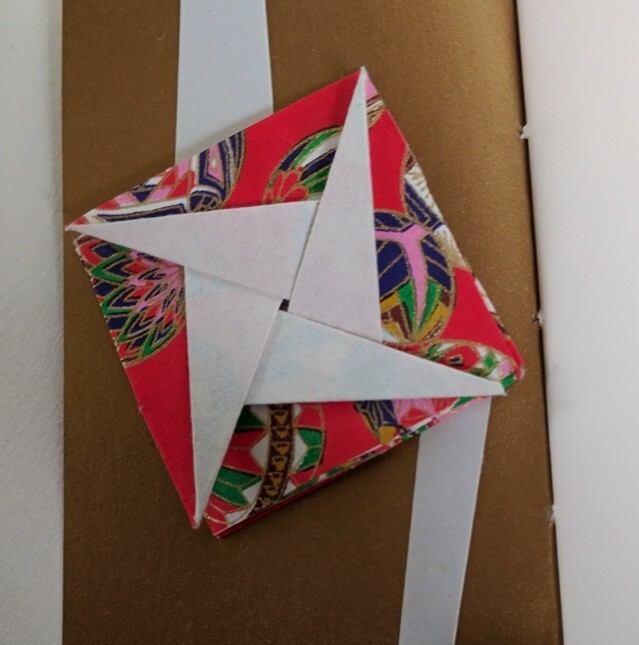 Unlike my Indigo, Gold and Red version, I didn’t use the Chiyogami paper for the outside wrapper. I tried out lots of options, but this handmade terra cotta paper purchased long ago from Dieu Donne Papermill was the best choice. I still have just a bit of this paper left, so I can continue using this for a few more wraps, but just a few. It’s hard for me to use up a paper that I may never see again, but I remind myself that I have it so that I can use it. 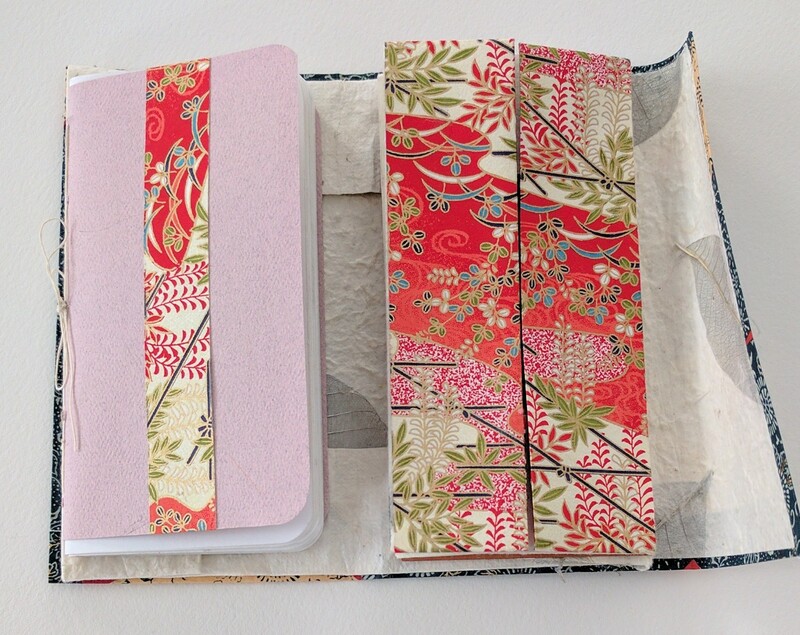 It takes awhile to assemble these thread books, but what has taken me the longest is to mix and match my papers until I am happy –and I demand to be really happy– with my paper choices. I try to let the papers I start with suggest the rest of the paper choices. Since this part takes so long, I am trying to make at least two of each paper/color combination, in an attempt to do at least a bit of streamlining. 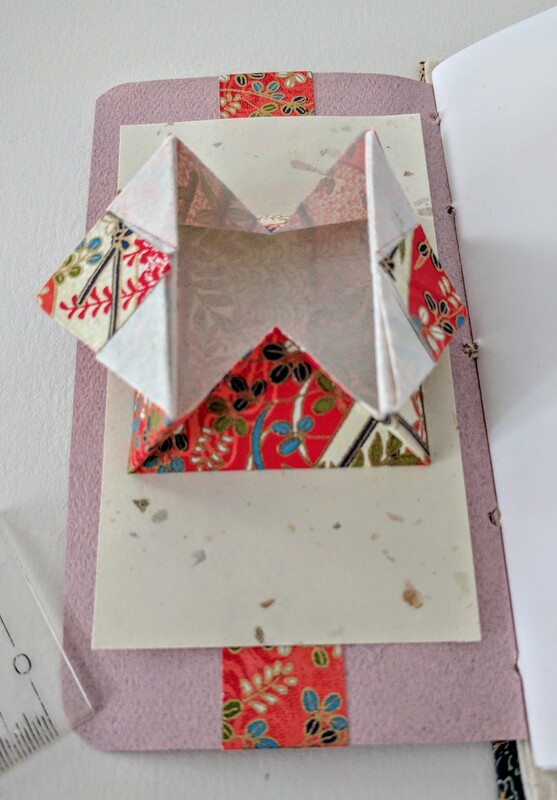 I’ve been cutting up my stashes of beautiful papers to design/make structures that borrow liberally from what I’ve learned about the Chinese Thread Book structure that I’ve been posting about over the last few months. Rather than strictly mimicking traditional Chinese structures, of which there are countless variations, I’ve been making variations of my own. 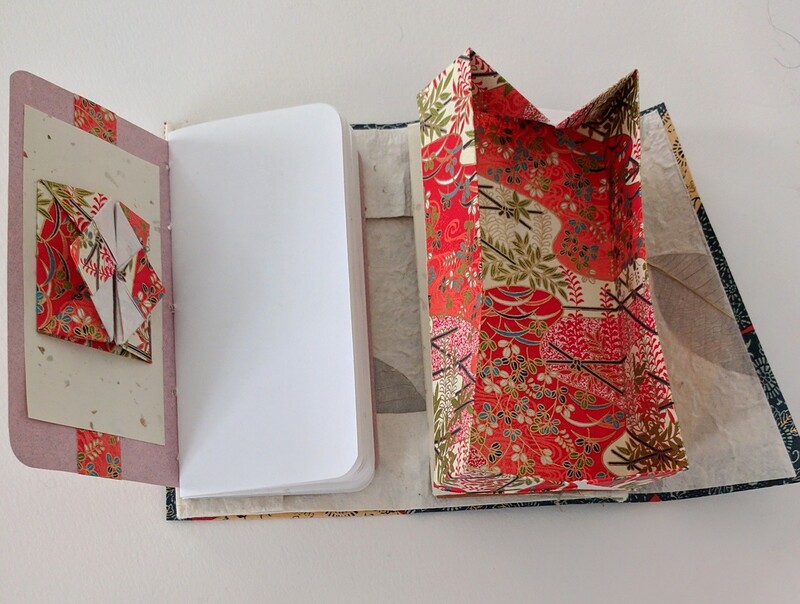 Basically, I’ve been repeating one design with different combinations of paper, but mostly featuring Chiyogami papers. So far I’ve made five distinct compositions of papers. 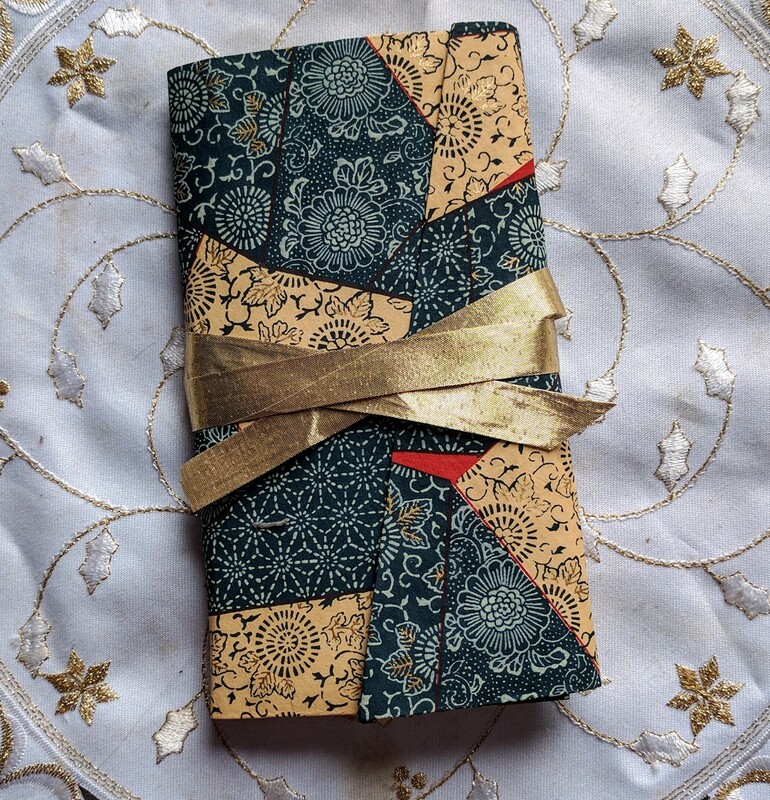 This one, with the indigo cover, and the red/gold paper inside, is the most romantic looking of them all. 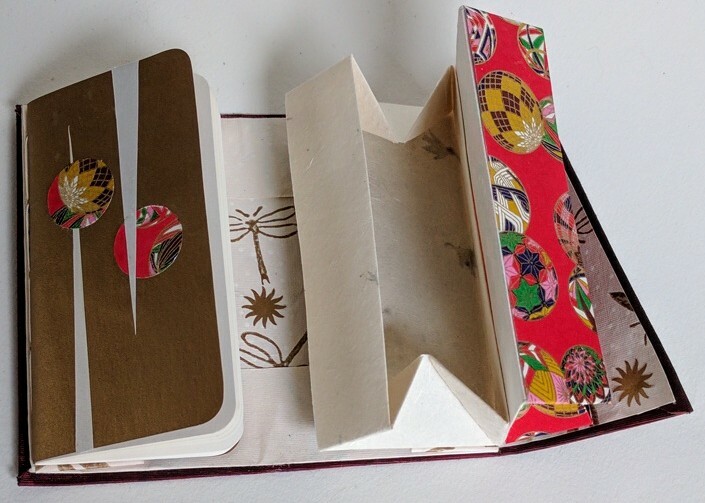 Inside, instead of going the traditional route and placing collapsible boxes on the verso and recto sides, I’ve chosen to place pamphlet on the left, and rectangular trays on the right. 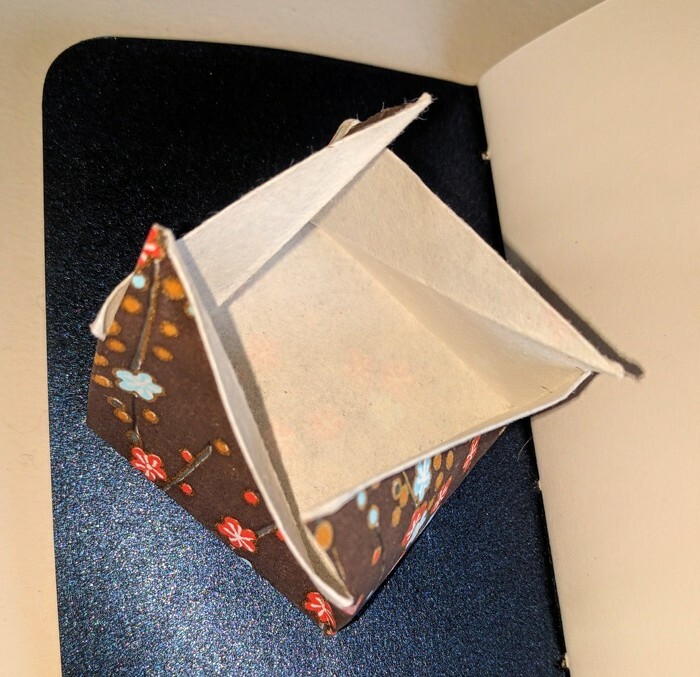 Still, inside the pamphlet there is a traditionally made, collapsed origami box. Here it is, that little box (a 2″ square), opened. 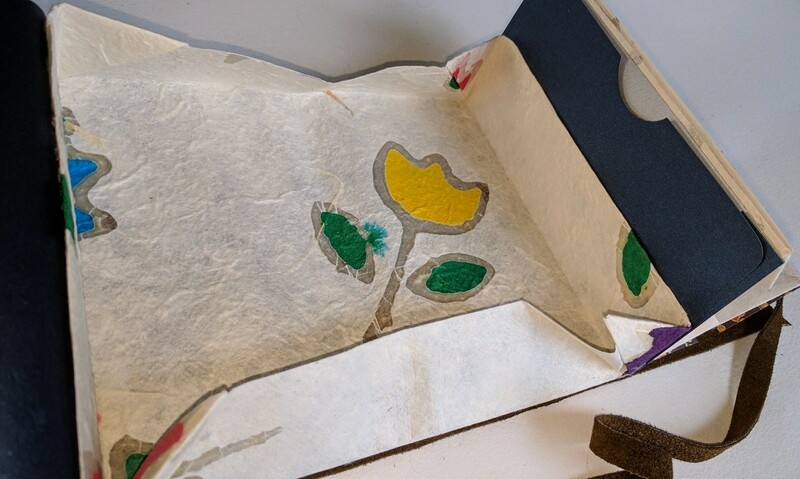 Next layer down is a machine-made paper, which contains real flower petals, a paper that is one of just a few pieces of paper I have left from the now extinct Kate’s Paperie. Finally, here’s the big interior box, made from handmade paper from India, containing leave skeletons. Also, you can see there’s a copper Stardream Metallic on the right, which is a slim pocket.